To this day, those little carton cards providing hours of recreational creativity are still enticing and arousing more and more followers. 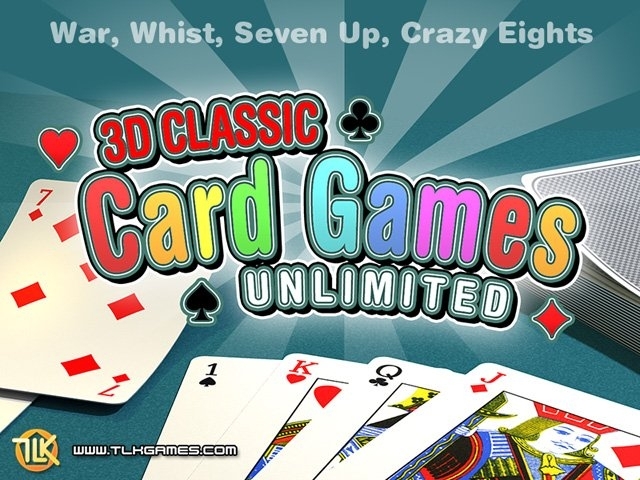 This program includes whist, seven up, war, crazy eights with up to three variations for each one. Whist, Whist 104, 2-Trump Seven Up, 2-person Seven Up, 4-Trump Seven Up, 4-Person, Seven Up, Closed War, 2-Person war, 3-Person War, Crazy Eights, Crazy Eights 108. Play with your friends on the network or online against others whose IP addresses are known. You may either begin a new game or join an existing one on the network. We offer simple and fun card games with 11 card models to choose from and the possibility to regulate the speed of card dealing. A number of image and sound options help to create an inviting atmosphere in a realistic environment. These options allow you to see the cards from many angles in a realistic graphic environment complimented by fluid animations. New players quickly learn the game rules thanks to player autonomy. Online help and menu help options are always available in the corner of the screen by clicking with your mouse. This program is compatible with Windows 98, Windows XP and Vista 32 Bits including a 3D acceleration card Direct3D and 8 megabytes of video memory. These programs are easily installed and uninstalled on your hard drive and respect the current rules and regulations. TLK Games guaranties regular version updates to keep up with real game evolution.